This replica was built in 2003, but launched one year later. It is based on a kayak from Bethel Alaska that historian John Heath acquired in the 50s or 60s from a person in Seattle related to a tugboat captain who purchased it in 1938. 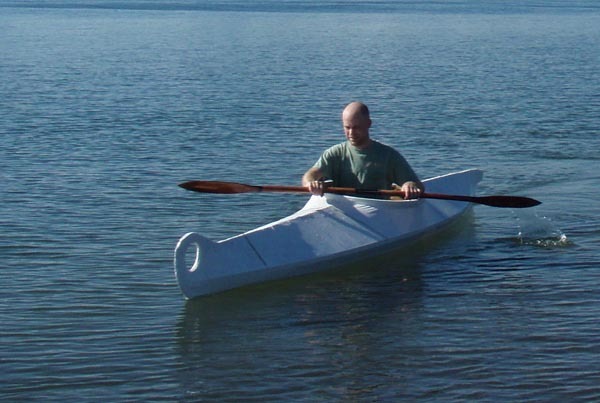 The kayak is 14'5-1/2" long, and 27-13/16" wide. The depth from the bottom to the top of the coaming is 20". The lines of this kayak are published in "Kayaks of Alaska." The replica's framework: Cedar driftwood ends, oak & ash ribs, redwood gunwhales, hemlock chines, cypress deck stringers, and oak deck beams. Estimated frame weight: 28#. Two views from forward-- one above, and one fish-with-X-ray-eyes view. a passenger-- in this case Kathy and Max; Max likes to stand up in this kayak.